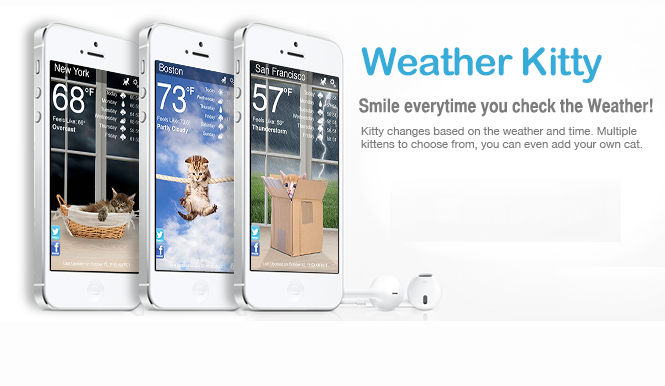 Weather Kitty is a fun app for iOS (coming soon for Android) that illustrates your weather forecast with images of adorable kittens. Everyone knows that cats rule the internet. From Facebook to YouTube and Instagram, you cannot escape cats online. Until now, the weather was free of this feline phenomenon, but no more. 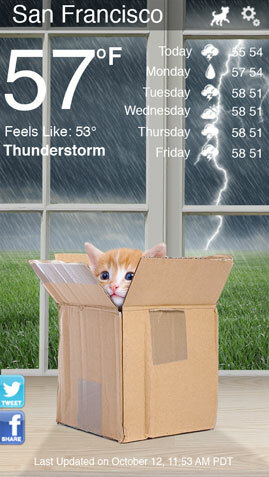 The cats in Weather Kitty change based on the weather, and you can buy more themes from within the app. Buying a theme, or upgrading so you can upload your own kitty photos gets rid of the ads within the app too. Weather Kitty does its job as a weather app too, with 5 day forecasts, multiple locations, humidity, sunrise and sunset times and so on. It’s not as elegant as the Yahoo! Weather app, or as stylishly minimalist as Haze or Solar, but it does have cute kittens, and it does tell you the weather. If kittens aren’t your thing, developer Creative Shark Software have also made Weather Puppy, which is the same concept but with puppies.